The KV-1 was simply not fast enough to support Soviet breakouts during the mid-war. The USSR needed a more mobile tank, but one which could stand up to heavier German armor. The KV-1S was a terrible attempt to answer this need. With inferior armor, the same 76 mm (3 in) gun, and higher cost than the T-34, it can largely be considered a failure as a tank. During 1940, Kotin and his team had already developed two prototypes for the KV-3 based on a modified KV-1, which would have fitted the new requirements of 1942. The first, the Object 220, had a longer hull, larger turret, and a 107 mm (4.21 in) gun. The second, the Object 222, had retained the same basic external design as the KV-1, but had a better turret layout. However, it was the need for a new powerplant that disrupted tank production in the critical period of 1941-1942, which led the GKO (State Defence Committee) to reject both KV-3 prototypes. The specification required the KV-1S to be much faster. To get a road speed of 40 km/h (25 mph), the tank needed to shed some weight, and therefore the armor was reduced, such as having only 60 mm (2.36 in) at the front. The turret was made thinner and it had smaller road wheels. A new gearbox, main clutch and improvements in engine cooling and lubrication also enhanced speed and mobility. Another improvement was the cast turret, which was redesigned completely to be smaller, and sloped. It had slightly sloped sides and, more importantly, all-around view for the commander. However, this KV-1S (for “Skorostnoy” – “fast”), was still much more expensive than the T-34/76, for the relatively same performances. By late 1943, there were concerns about the overall effectiveness of the vehicle. Production started in August, 1942, but, after 1370 vehicles had been made, it was discontinued in late 1943. This was partly due to the vehicle not being liked by tank crews and tank officers, such as General M.E. Katukov, who convinced Stalin in 1942 that a KV with a more potent gun or one of greater caliber than the T-34 might excuse its overall shortcomings. 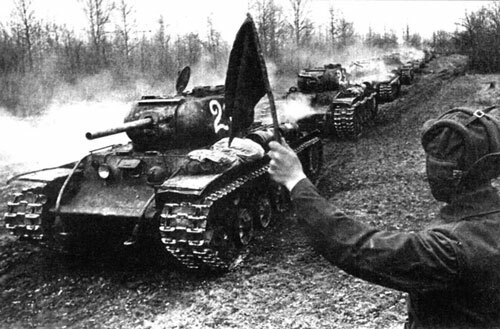 A column of KV-1S tanks. The KV-8S was equipped with an ATO-42 flamethrower, 25 produced. The KV-8M was similar to the KV-8S, but equipped with two flamethrowers. Only two prototypes were constructed. The KV-1S saw action at Kursk in 1943, with the 53rd Guards Heavy Tank Brigade. The unit took part in the fighting of 12-14th July that broke the main thrust of the German offensive. Some KV-1Ss are alleged to have taken part in the Berlin offensive, but most had been allocated support duties by that late stage of the war. Whilst the tank was able to boast new features, such as having a new commander’s cupola with all around view-port blocks, more reliable engine and much needed speed, it did not make up for the fact that, at a time when German guns were getting bigger and more potent, the armor of the KV-1S got smaller. The KV-1S was also still much more expensive than the more versatile T-34/76, which boasted similar performances. 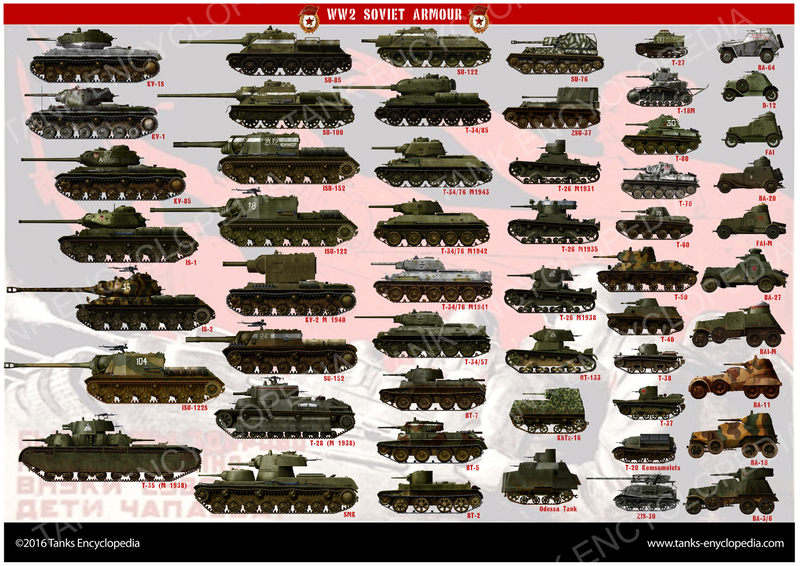 It is true to say that the KV-1S was generally unimpressive in terms of combat, but it must be remembered that it did greatly influence the design of late-war tanks such as the T-34/85, KV-85 and IS tank series. KV-1S (for “Skorostnoy”, “fast”) model 1942 with spoked wheels, unknown unit, Central front, fall 1942. 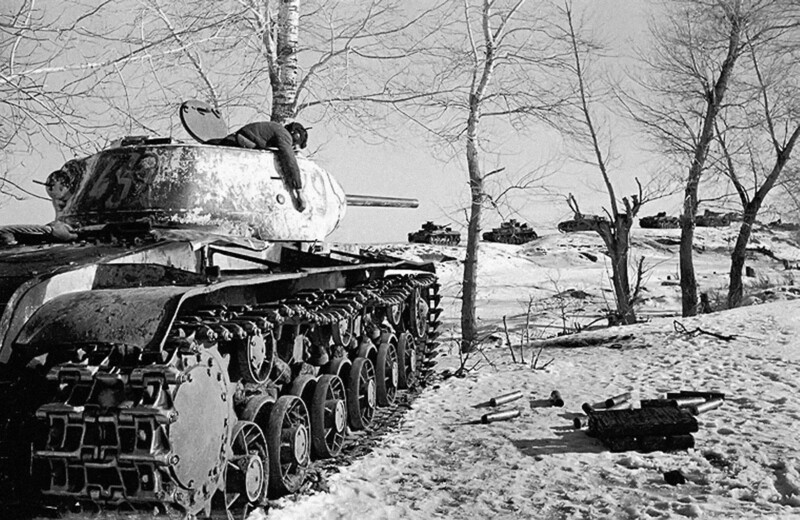 KV-1S model 1942 with the new late roadwheels, lead or commander tank, winter 1942/43. KV-1S model 1943, unknown unit, Southern front, summer 1943. KV-1S model 1943, unknown unit, Eastern Prussia, winter 1943/44. KV-1S, late production, unknown unit, Berlin, May 1945. 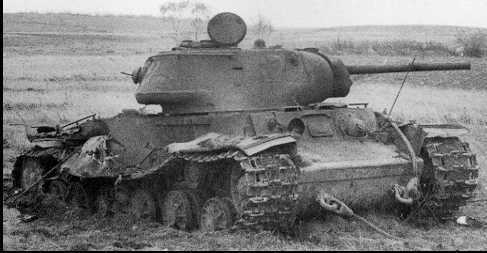 A knocked out KV-1S. The armor was far too inadequate during the mid-war, as it often faced upgraded Panzer IVs, or worse. A knocked out KV-1S circa 1943, with the dead commander hanging from his cupola. It had just engaged the German column in the background.